As we flew in over the Gulf I could see snatches of the devastation — some downed trees, blue tarps covering roofs, some piles of debris — but it wasn't 'til we piled into the shuttle that the extent of the damage came into focus. At first, as we drove away from the airport, it was mainly boarded up store windows, piles of twisted metal and lumber, and some shattered billboards, but then we went into the restricted zone right along the beach. The van driver warned us not to take pictures — officially frowned on by the Red Cross for sensitivity/privacy reasons — so I had to take it in with my eyes. It's like a bomb hit the place. The road along the coast used to be lined with houses, hotels, and restaurants. Most of them are completely gone, right down to the foundations. Some images: each street address we passed was marked with a spray-painted address and the residents' family name. Some included messages like "all OK" or "we'll be back." The trees, which look like they were once majestic and beautiful, are just gnarled limbs, most of which are covered in wind-blown clothing. It's an eerie sight, these grayish-brown trunks and branches dotted with colorful T-shirts and underwear. When we passed a river, I saw fishing boats and sailboats had been tossed around like toys. A couple of big boats were actually resting in a knot of tree branches, 20 feet off the ground. Awe-inspiring. We got here just a little too late for orientation, so I'll head "home," which is the Navy SeaBee base in Gulfport. Then I gotta get up good & early for 8 AM orientation, where I'll be assigned my duties for the next three weeks. The rumor is that there are laundry services available. Go, Josh! Please post as much as you can. I'm proud of you. Bring us back some etoufee! Meg (Sara) and I were just talking about you and this moments ago (she just departed into the rainy night after our music session with Bones). Wash your hands a lot and take care of your own self. You do a good thing. Hugs. some kids on the other side of the plane as we came in were talking about a casino boat, but i didn't see it. the kids (ages 14 and 9) were coming back home for the first time since the hurricane. the older one had to start school today. i read that Mississippi governor Haley Barbour just passed legislation allowing casinos to actually build on shore now. seems like this storm came in very handy. You are correct, none of the Casinos on the coast were those quaint riverboat types. They were built on barges with lots of steel. To be honest when you went into the valet area or the parking garage and then entered into the casino you'd have no idea you were on a barge or in water. All of the casinos were very lavish. 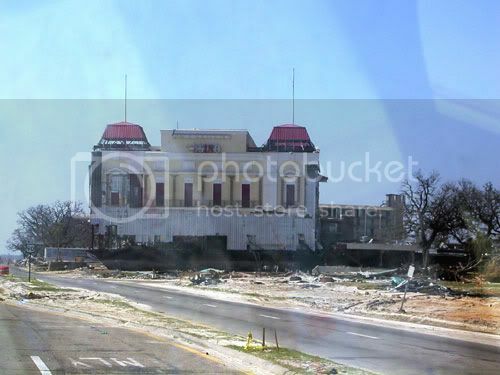 The one you photo'd above was the President Casino, which incidently was due to be moved much further west into Gulfport some time next year. The "new" location you see above USE TO BE a Holiday Inn Express adjacent to the Mississippi Coast Coliseum & Convention Center, right on Hwy 90 in the heart of Biloxi. I live about 1 mile due north of that location off Pass Road. That casino traveled about a mile or so east up hwy 90 before it's final resting place. I hope no one was in that Holiday Inn. Pretty much all of the casinos were in the same condition, they were broken away from their moores and floated inland north of Hwy 90 causing even further distruction. Several years ago when the industry faught to bring legalized gambling to Mississippi the religious organizations faught back hard, and they some how came to an agreement that if the gambling took place over water it wouldn't be an issue with the State not allowing gambling. So they built the barges, and the resort hotels and other non-gambling facilities on land. The idea was in case of a hurricane to have the barges towed out to a safe area in the Gulf. Apparently they're not doing that anymore and this is the direct result of that decision shown above. In recent light of events the state was in a debate over gambling on land, and even though there was once again great debate from religious groups the state did infact pass legalized gambling on land. They're now going to be allowed to build 800 feet away from water. With their entire property built on solid foundation if something like this ever happens again the damage will be far less than with barges. 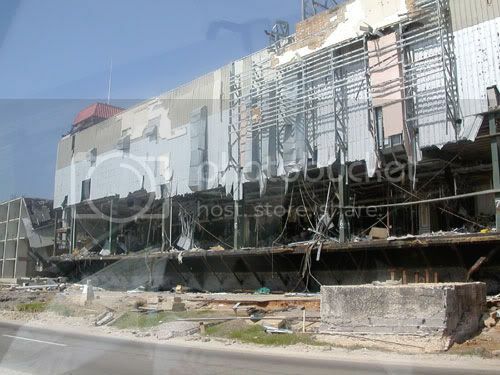 I think had this of happened only a year or two after the casinos were first established here they wouldn't of allowed it. And of course the casino industry would of just packed up and left for another place. That was the general threat (so to speak) being made by them. Basically be allowed to come ashore or not stay at all. It's been several years now, and the gulf coastal communities have grown acustom to them being here. They were a part of our daily lives. If you didn't work directly for them then some how you still worked indirectly for them or did business with them, and even then if not you knew someone close to you who worked for them. They really weaved their way into the area well. The massive budgets each city had was based hugely off of them. That is why in the couple of months the City of Gulfport and Biloxi both said they would be out of money by the end of November. They were slashing millions of dollars from their budgets just to maintain something of a structure. A lot of money comes because of them. So you can see the leverage they have now as opposed to before they were well established. And I'm not implying that they're the "evil corporation" by any means. I too have slept with the devil so to speak from time to time. I knowing a few high ranking professional gamblers was given cart-la-blanche at a couple of the bigger casinos. I could walk in any time day or night and had thousands of dollars worth of comps at my disposal. If there was an Eagles concert I wanted to attend which tickets ran for $75 a seat, no problem, I go to the comp desk present my magic card and instantly be given how ever many tickets to that show I desired. Or if I was hungry I could just walk into their unbelievable buffet and eat some of the best food you've ever tasted, prepared by master chefs straight to my table FREE all the time, every time. So I certainly gained something from them being here. Not to mention it was fun winning at blackjack the few times I played it. I was happy to help fill you in on some of the photos you took. And you're right. I couldn't imagine it either. Even after seeing it with my own two eyes. The storm surge HAD to of been really high for the water to be deep enough for those huge barges to break off and float down Hwy 90. Josh, this is the first time I've seriously checked out a blog. Certainly the first time I responded. And here you are on this very day arriving in the Gulf, and here are your thoughts about it...... and Gali died! and your anniversary happened..... I have to process the change and import of all this blogging. Good luck with your good work. thanks, zoe! welcome to one more way to waste time on the internet. just wanted to weigh in and let you know how amazing it is you're doing this. I have boatloads of respect for you and how you're walking the walk instead of talking the talk (like me). Good luck and godspeed, and I hope (like man-size) you can tell us this story in GN form someday. Be safe, and best wishes. I think it is tragic what has happened. All the homeless and poor people stuck under a dome. I hope all we learned the lesson and became stronger.